David Harmer and Ray Globe recently turned 60. It’s just a number. Right? The irrepressible Glummer Twins are back to celebrate the joys, absurdities and indignities of getting older. Stand-up spoken word from the Beat Generation. A delightfully downbeat double-act with a unique take on stand-up spoken word comedy and music. 'Think Morecambe and Wise crossed with The Mighty Boosh' ***** (BenHuxleyBlog.wordpress.com). 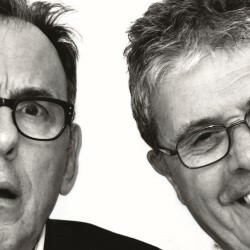 'The guys are genuinely funny' (Edinburgh49.org). 'Completely different take on stand-up. Seriously clever... very funny' (Sandra J Cooper, Buxton Fringe). Twice-nominated Buxton Fringe Best Spoken Word Show. Coach parties welcome. Warning: may contain dad dancing.